The Secret Of Storytelling: What's Your Hero's Simplest Emotional Journey? What's Your Hero's Simplest Emotional Journey? Recently, I'd read a post on Save The Cat that revealed screenwriter Billy Ray's secret to bringing out the primal element in a film--something the audience could relate to. His method for digging down to the core element of his stories was quite simple. What is your hero's simplest emotional journey? On the back side of that 3" x 5" index card, he wrote the answer to that question as it pertained to the story he was sharing with the group. Billy Ray is one of the most successful screenwriters in Hollywood, with blockbuster films such as The Hunger Games and Breach under his belt. And he was gracious enough to divulge one of his key secrets to telling great stories in a writer's workshop. I wished I'd been there that day, just to glean his storytelling wisdom. This was a truly incredible piece of advice he shared. Game-changing, actually, as it relates to storytelling. This nugget of wisdom was so valuable to me that I decided to put it in my storytelling toolbox. Then, I took this concept of the hero's simplest emotional journey a step or two further. I implemented it into my method for defining the point of every story I write. It came to me like a glorious vision. This monumental question, coupled with defining the point of my story would surely give me divine insight into determining what my protagonist's inner struggle would be. Every time. It would help me uncover what her greatest goal and her longstanding misbelief would be, and how they would battle each other along the protagonist's third rail of the story. This monumental question can also help you define your story's point, and determine your hero's inner struggle that will captivate readers from the first word of your novel to the last. What is my hero's simplest emotional journey? Here's how I answered the question for the heroine, Sandra Porter in my young adult novel, From Bad Girl To Worse. 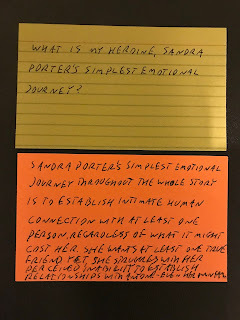 "Sandra Porter's simplest emotional journey throughout the whole story is to establish intimate human connection with at least one person, regardless of what it might cost her. She wants at least one true friend. Yet, she struggles with her perceived inability to establish relationships with anyone--even her own family." See the index card example here. I wished I'd already known to ask this question about my protagonist's emotional journey while I was in the early stages of story development for From Bad Girl To Worse. How much easier would the writing and editing--and even the plotting--have been? What is the point that I want my story to make? Your tale will have the enchanting power to keep your readers reading if you determine as early as possible what your protagonist's simplest emotional journey is. Let your answer be the true North of your writing compass. Let it guide you like a brilliant beacon you through every step of your novel writing process. Let the answer help you figure out your "Big What If" and your high concept pitch. Let it help you craft your Blake Snyder beat sheet and your Story Genius scene worksheets. Just make sure that your hero's simplest emotional journey is primal enough for anyone to relate to. Make it easy enough for even a caveman to understand. That way, any reader can follow along with your hero from the first chapter to the last. Finally, craft your hero's emotional journey so that it forces her to undergo a profound internal transformation from someone who's ordinary to someone who's great. If you do, you'll have readers you don't even know recommending your book to everyone they do know. P. S. - Your hero's emotional journey is synonymous with her internal change. They are one in the same. That's what make the emotional journey so powerful for your hero--and your reader.